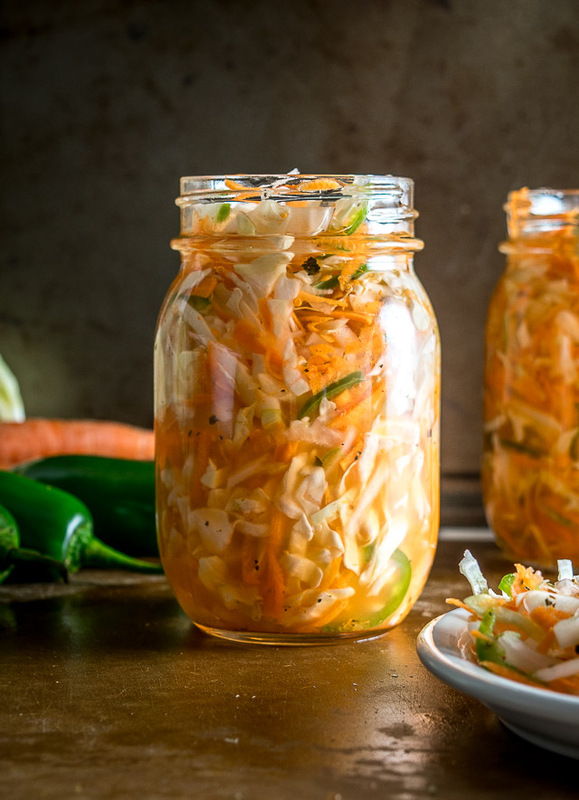 Curtido is a pickled cabbage delight that also happens to be a great investment. Spend a few minutes building a batch and you’ll have the option of nibbling on it for the next few weeks. 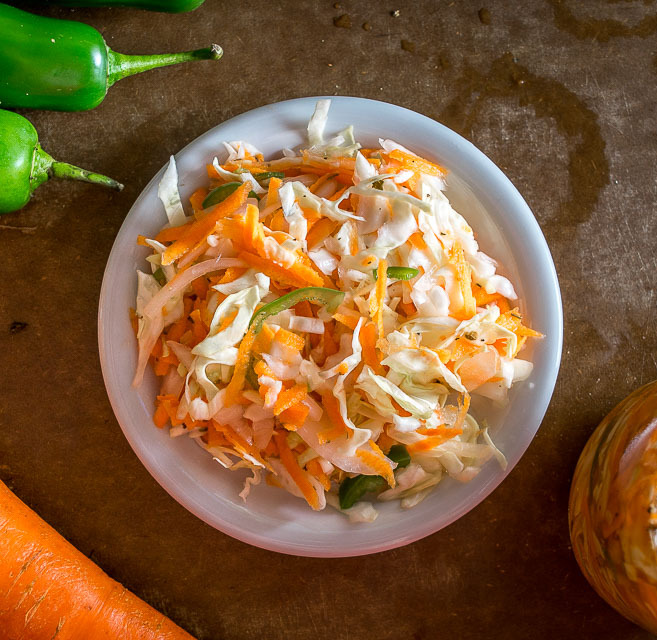 In Central America it’s common to serve curtido with pupusas and other corn cakes, but you can use it on just about anything, including tacos, sandwiches, and anywhere else you use a traditional coleslaw. This recipe is enough to load up two pint-sized Mason jars with veggies and brine. Not pictured is the overnight resting period where the real magic happens. Similar to our pickled jalapenos, you can still eat it shortly after making, but it will only be a preview of what’s to come. Letting it ferment overnight will allow the full flavor to develop. 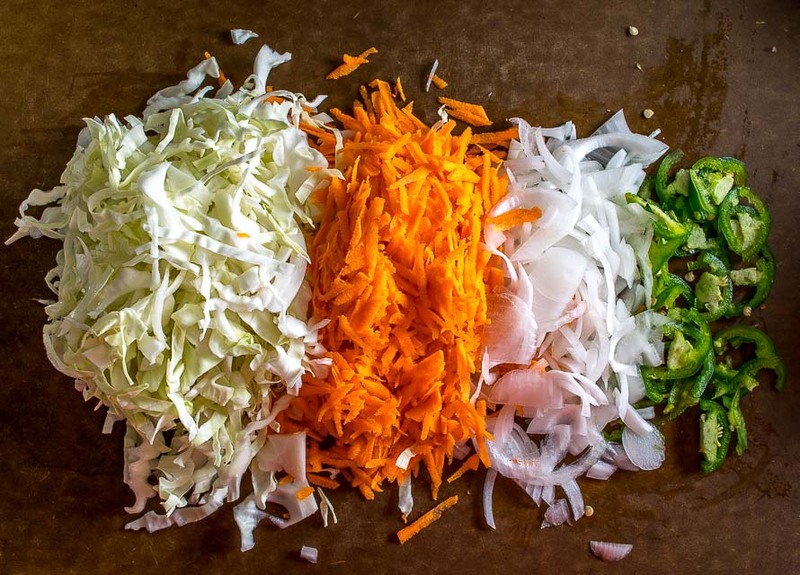 You can use a food processor if it’s convenient for you, but thinly slicing the cabbage and grating the carrot works just as well. Note that we are only using half of a jalapeno but this still gives it some serious zip. If you want a milder version I would recommend starting with 1/4 of a jalapeno. Kosher or pure sea salt are most commonly used for pickling. The additives in iodized salt will sometimes affect the brine so it isn’t recommended. Add this mixture to the veggies and combine well. Crushing the cabbage a bit while mixing will help it fit into the Mason jars. Load up two pint-sized Mason jars with the veggies (tongs work good), and then fill them to the top with the brine. Seal well and let them pickle overnight in the fridge. 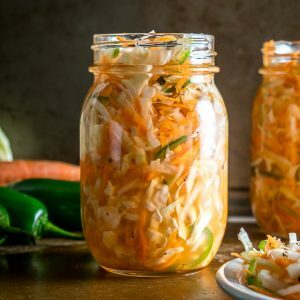 The next day you’ll have a zippy pickled delight that just might replace your traditional coleslaw. What?!! And you’ve just upgraded your fridge for the next few weeks. Well done. Don’t forget that using a half jalapeno still creates some real heat even though it doesn’t sound like much. You can always dial back and use less (or none) if you want a milder version. 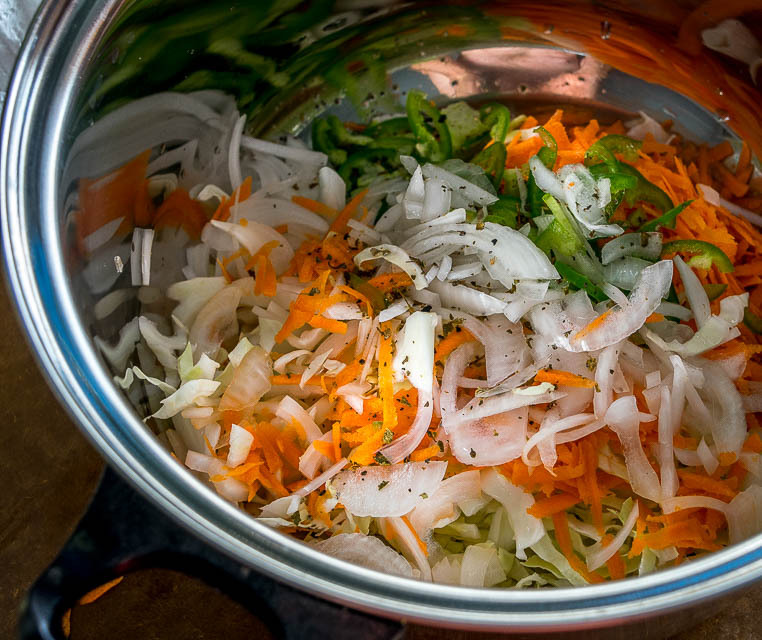 Thinly slice the 1/2 head of cabbage, 1/2 onion and 1/2 jalapeno. Grate the carrot. 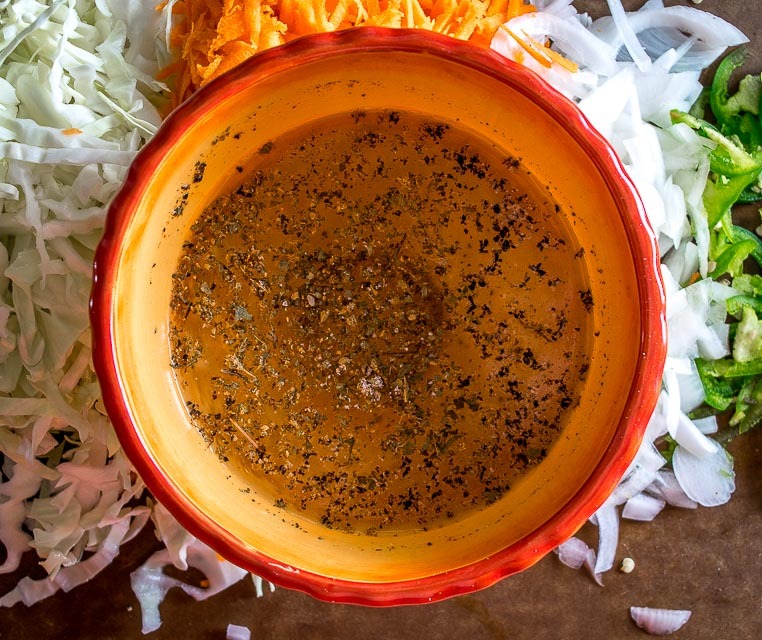 Combine the remaining ingredients in a bowl: 1 cup vinegar, 1.5 cups water, 1 teaspoon Mexican oregano, freshly cracked black pepper, 2 teaspoons salt (Kosher or sea salt). Add the liquid mixture to the veggies and combine well. Crush the cabbage a bit so that it will fit into the jars. Fill two pint-sized Mason jars with the veggies and top with the brine. Seal well and let ferment overnight in the fridge. Using a half jalapeno still creates some real heat even though it doesn't sound like much. You can always dial back and use less (or none) if you want a milder version. If you don't have Mexican oregano you can simply omit the oregano. 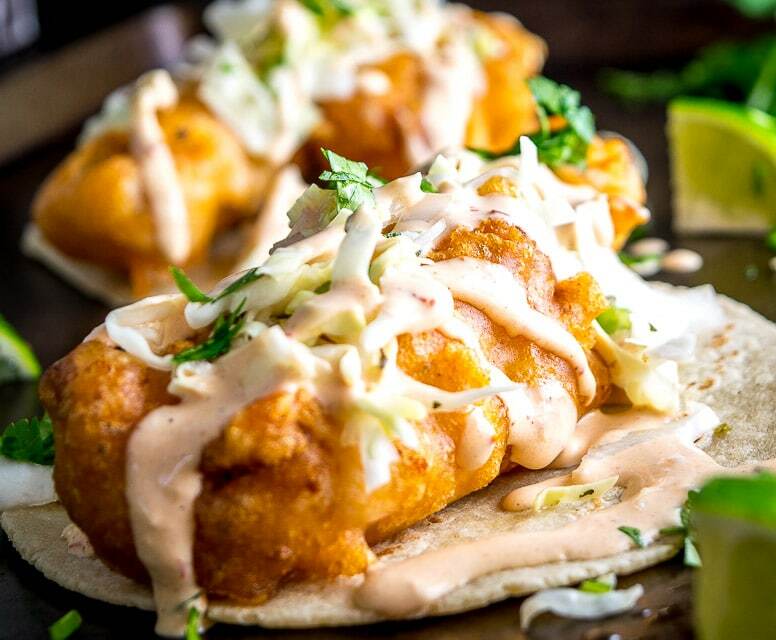 We use a cabbage-only version of this Curtido in our Baja Fish Tacos. 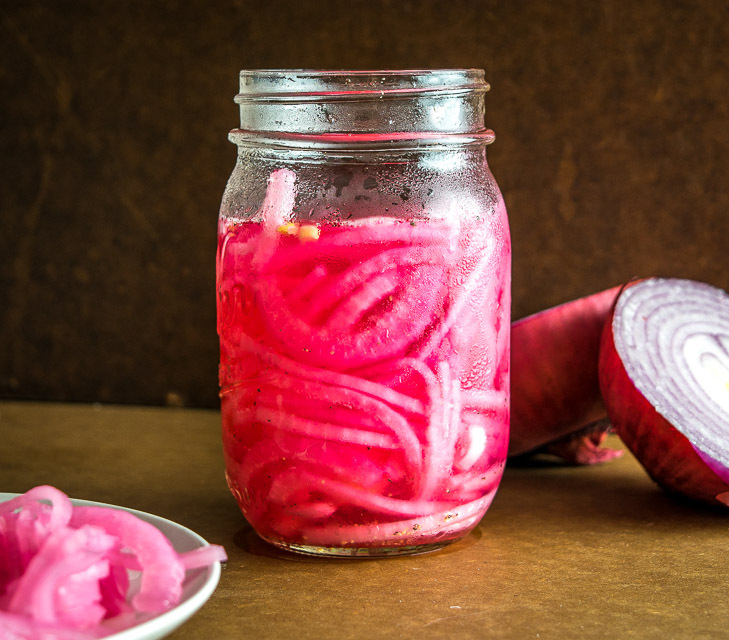 You can use a similar technique to make some pickled onions. How about a whole jalapeno?! Why Mexican oregano or none at all? Is it that much different? Thanks for that info. I never knew that. I made thr Curtido over the weekend and it’s delicious! Love your site. Keep up the great work. Awesome Lou, thanks much for the feedback on the Curtido, so glad it worked out for you. Cheers. Can’t wait to make all of these recipes! Today is pickled jalapeños. Thanks for sharing!! Hola Teri, thanks for your note! That pickled jalapenos recipe is easily one of my favorites on the site, hope it treats you as well as it’s treated me. Cheers. Hola, Patrick! I made this curtido last weekend, & barely had a chance to taste it before my (non-Hispanic) godsons absconded with it. They loved it! Many thanks for your great recipes. So many of them remind me of my mom’s, which I loved but never learned to make. So here’s my opportunity, & I’m taking full advantage! Awesome, thanks much for the feedback Esther! Amazing how simple it is to make Curtido eh? I’m so glad you are finding some keeper recipes on the site, let me know if you ever have any questions. Cheers. Central American kimchi! At least, it reminds me of kimchi. I wonder if you can let this ferment to produce a lactic acid pickle flavor instead of using vinegar? It sounds worth trying. It looks like there is 3 day wait time before a familiar flavor develops, which might sound like an eternity to some of us 🙂 Let me know if you try it! I make it all the time by fermenting. Your Curtido recipe is not fermented but rather pickled. Vinegar will prevent fermentation. After you ferment it for 5 days you can add the vinegar and oil as you serve it. That way you get the great benefits of fermented food and those wonderful bacteria! Awesome, thanks much for your insight Morgan! I kinda want to try it, and just to confirm…you’re not adding any additional liquid or water it’s just the cabbage fermenting in its own juices correct? Hey Jess, Happy New Year! I almost always use standard no frills white vinegar. Just made this, and used 2 small jalapenos. Wish me luck! Nice! That is going to have some serious zip! Have you ever added julienned zucchini? I’m wondering if that would work . Hi Pam! I’ve never tried the Curtido with zucchini so I can’t say for sure, but I think zucchini is supposed to pickle quite well so I think it would work. Take some of the mix and add the zucchini so your not loosing alot of the mix. Thank you, Patrick! We’re trying it now. Alot of recipes use hot to boiling water. Can you tell me why and witch one is best? I do the same thing sometimes but for this Curtido I tried it without boiling the water and was happy with the results so it’s become habit at this point. I think boiling the water is a leftover characteristic from the canning world where hygiene is paramount — it will purify the water, quickly dissolve the salt (or sugar), and make for a “cleaner” jar. But since we are not doing long term canning in this recipe I think it’s less important. Hope that helps a bit. Let me know if you have any more questions. Cheers. OMGoodness! This is the best!!! Soo delicious! Thanks so much! Made exactly as instructed. I like be in Alabama (which is not the Hispanic food capital !) I had pausas as a restaurant (far away) once and of course I have to have them again. Your site is great! Keep it up! Thanks Marvel! So glad you like the Curtido! Hi Patrick! I just made this a few days ago for pupusas, let it sit for a day, and it’s over half gone already! I am making more as we speak because it is JUST THAT GOOD!!! The plan is to put it on a pastrami sandwich for work tomorrow. I used 2 serrano peppers and it still wasn’t as spicy as I wanted, but I do have an iron gut when it comes to spicy food.😁 Thank you for your wonderful recipe! As you said, it will be more of a staple around here now! Ha awesome, thanks for the feedback Rebecca! So good to know there are people out there who are not satisfied with 2 serranos! Does the cabbage become tenderized a bit with this cold overnight process? It does a little bit Gordon, but I feel like it still retains some of its crunch even after sitting in the brine for a few days. Cheers.